All you need to know, Plus a Cool Jersey! You can camp in the group campground as part of your entry fee or pay your own way and make your own arrangements in the cabins, RV sites, or non-primitive campground in the park. Another option is stay at a nearby hotel or B and B. The entry fee is structured to include guests camping in the group campground. If you choose to stay in the cabins, RV sites, non-primitive camp sites, hotels, or B and Bs you must make those reservations on your own and pay for them separate from the entry fee. Click HERE for details on hotel. Click HERE for Special rate info! Straight forward hotel with free Wi-Fi, parking and breakfast, plus an outdoor pool and a fitness center. Chic rooms and suites in a contemporary hotel featuring a casual bistro/bar and an outdoor pool. Streamlined rooms in a contemporary hotel featuring an outdoor pool, a gym and free breakfast. Informal hotel with a heated indoor pool, a business center and a gym, plus free breakfast. 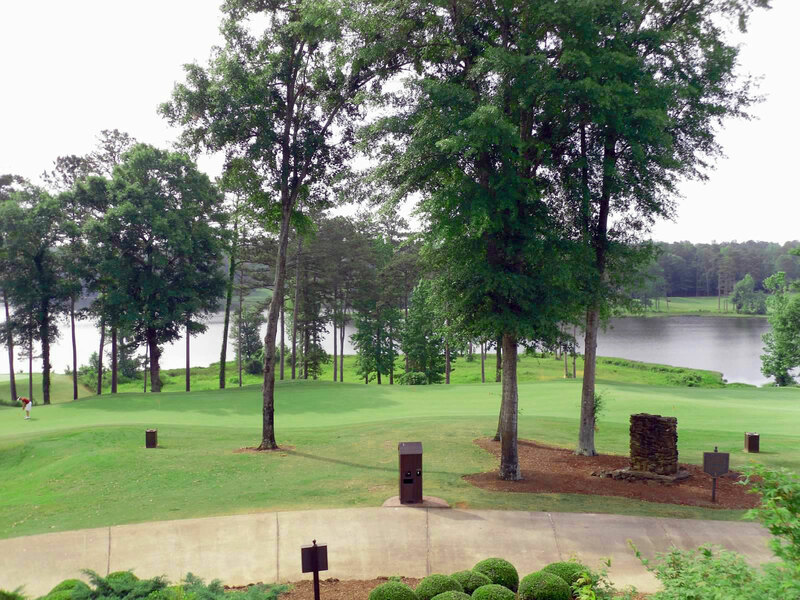 Upscale accommodations on the Auburn University campus, with dining & a seasonal outdoor pool. Contemporary hotel with an American restaurant, business center, plus free WiFi & parking. Contemporary hotel with free Wi-Fi, parking & hot breakfast, plus an outdoor pool. We mark the day's routes with a distinct arrow and maps with cue sheets are in your registration packets. Changes during the ride will be relayed via text message. Daily mileage ranges from 51 to 100 miles depending on options chosen. The 100 miles would occur on day 4. Cumulative miles are at least 255 or 412 if optional miles are added. Breakfast is offered for those choosing the breakfast option at registration. Limited lunch provided when no commercial facilities are available on route for you to purchase your own lunch. Dinner is on your own but many participants choose to meet up at common restaurants. Auburn has many dining options and some of the best in the country. Daily Rest Stops will be provided on route, approximately twenty miles apart, where convenience stores or restaurants are not available. Stops are stocked with water and snacks, approximately twenty miles apart. SAG (Support Aid Group) Service will be provided each day for a limited time. SAGs have water, bike pumps and first aid kits. Bring your own pump, extra tubes and repair kits to change flats and a multi-tool to get you on the road faster. SAG service is provided for mechanical or emergency pickup along the biking route. It is not intended as a taxi service. You will not be SAG’ed if you venture off the official biking route. We carry 700 x 23 tubes in our SAG vehicles. A bike mechanic will be on call, or you can visit James Bros Bikes in Auburn for repairs. You must pay for the parts and repairs. Weather in the Auburn area of Alabama at the time of this ride should be hot and humid (80 to mid 90 degrees) but cold spells (60 degrees) occasionally happen. Wind is always a threat and can be unpredictable. Rain is always a possibility so be prepared on and off the road. It is not unusual to have rain in the afternoon for a short period. When it does come it can be spotty, raining in one place and not another. Is rolling hills with some climbing. Might be too taxing for a beginner. 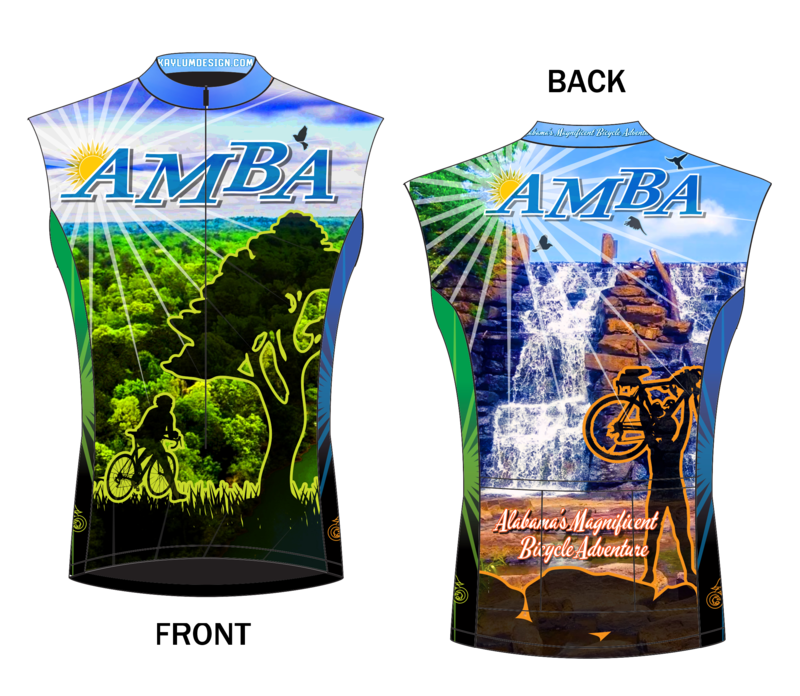 The jersey comes in Men's or Women's style, with or without sleeves! It also comes in Sleeveless! 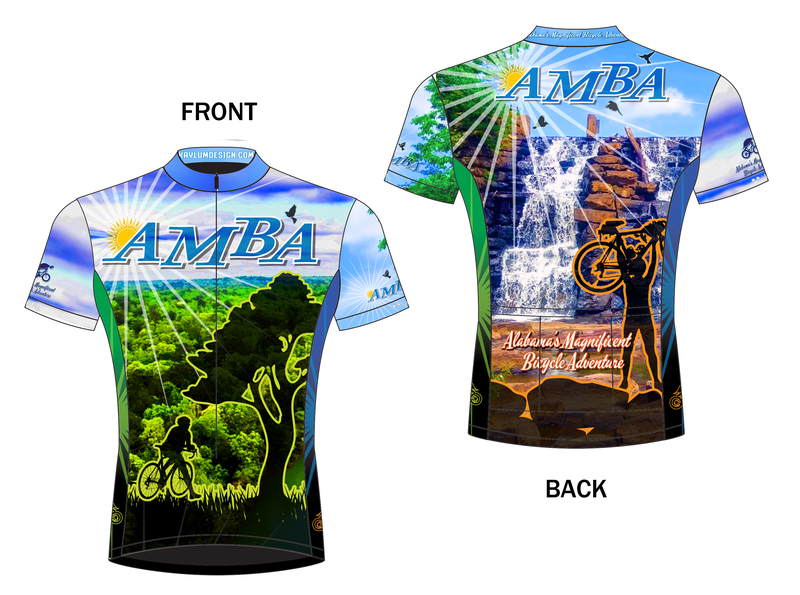 This jersey is made by Primal. More info and ordering info to come! We recommend you look at THIS sizing chart before ordering.